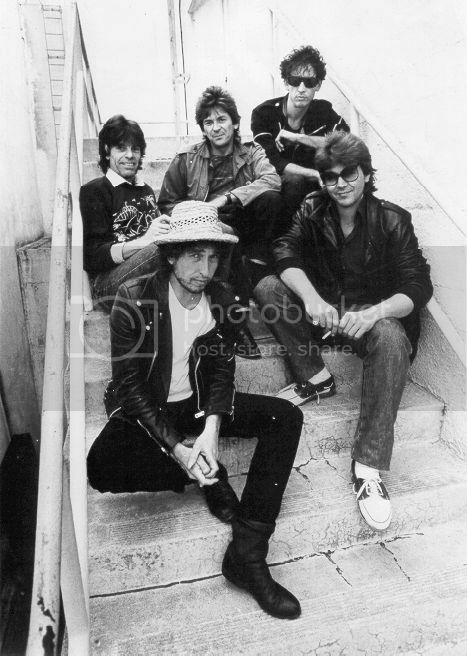 Colin Allen, Ian McLagan, Greg Sutton, Bob Dylan & Mick Taylor, 1984. Bob Dylan with Mick Taylor on lead guitar performing “Every Grain of Sand” at Parc de Sceaux, Paris, France on July 1, 1984. And the solo on this next one is amazing! This next sequence is beautifully filmed. It starts with an interview, then cuts to Dylan and band with Mick Taylor on stage at Arena di Verona on May 28 or 29, 1984 doing “Like A Rolling Stone” followed by an acoustic version of “Blowin’ in the Wind” with Mick Taylor on acoustic as well.